For manual warewash in food service, hospitality and janitorial applications, professionals turn to the robust, reliable ProSink and ProSink R to achieve high-accuracy chemical mixing and dispensing. Designed specifically for the dilution and dosing of detergent and sanitizer into sinks, these single and double-chemical solutions deliver consistently-precise dosing at the turn of a knob, with no electrical or compressed air connection required. The units are housed in robust, easy-to-clean stainless-steel enclosures that can be customized with company branding, product information or safety notices. 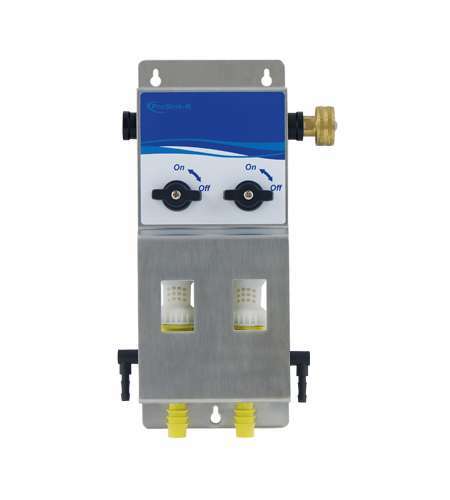 Installation requires only two or three screws and direct connection to a water supply, while the unit’s ‘quick connect’ manifold ensures simple tool-free maintenance.